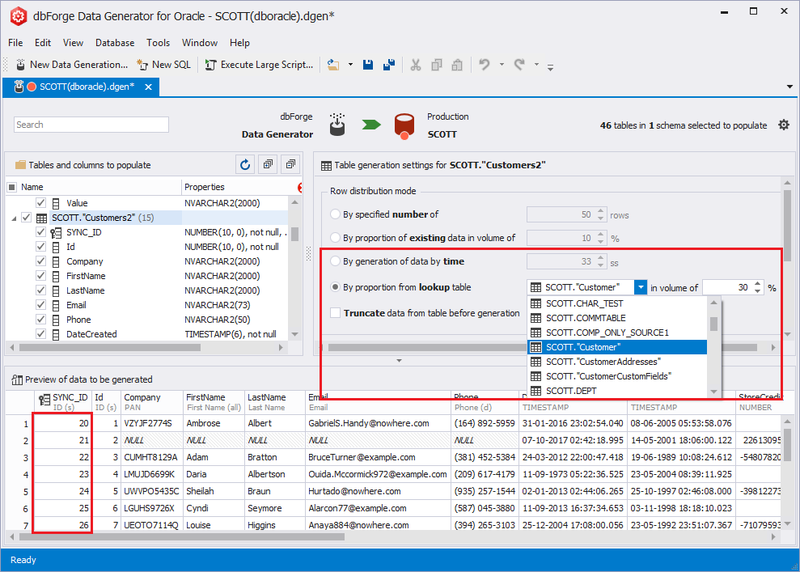 We are glad to notify our users that a new version of the Devart Oracle data generation tool has been released – dbForge Data Generator for Oracle, v2.0. The new version allows creating and saving your personal data generators, generating data to tables already filled with data, run data generation in a single click and much more! Data Generator for Oracle, v2.0 makes the creation of custom generators much easier. All you need to do is to customize an existing generator, click Save Generator As, and provide name and description for your new data generator in the Save Custom Generator dialog box. As a result, your personal data generator will appear in the Data Generators list in the User Defined group. 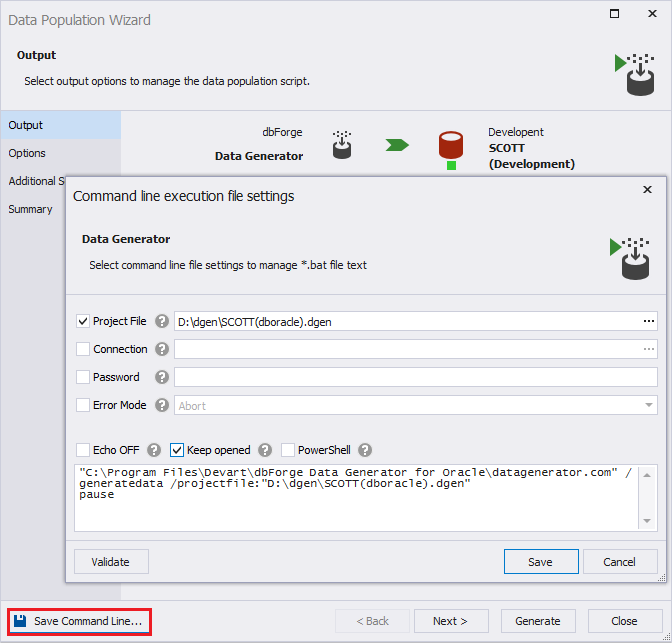 The updated Data Generator for Oracle features new row distribution modes that can help you to fine-tune the way you want data to be generated. In particular, now you can generate data by the time specified (the By generation of data by time option) and generate data using a linked table (the By proportion from lookup table option). Also, you can generate data to existing tables already populated with data. For this, just clear the Truncate data from table before generation option. 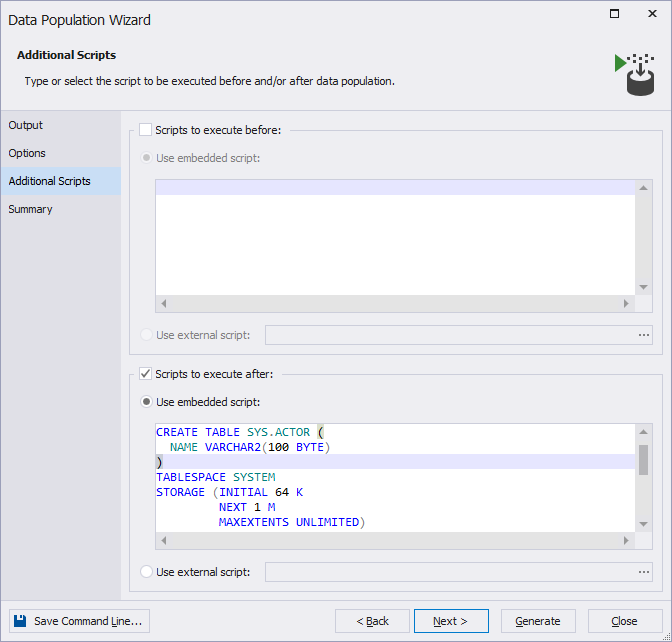 Data Population Wizard includes a new tab, Additional Scripts, that allows typing or selecting a script to execute bere and/or after data population. 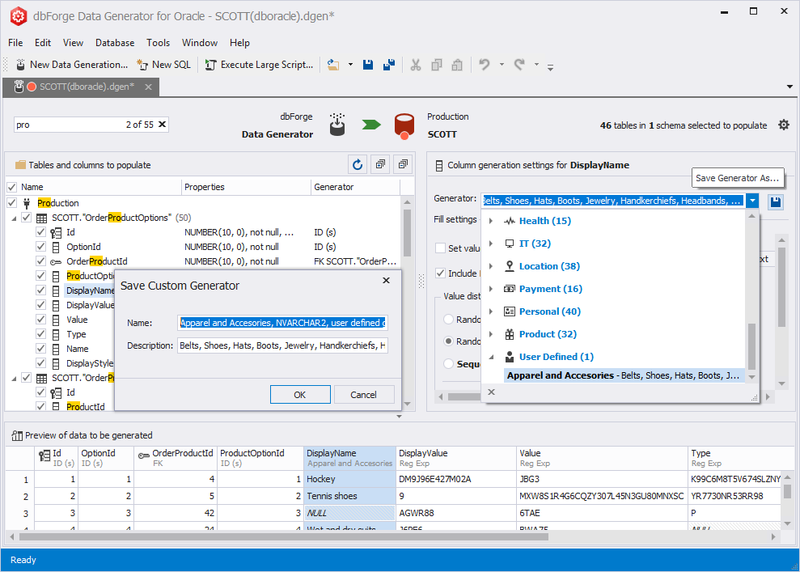 Data Generator for Oracle provides a new way to optimize routine data generation tasks. With the Command line execution file settings dialog box, you can create a batch file (.bat) and run it whenever you need to generate new data. We welcome you to try the updated dbFogre Data Generator and share your thoughts about its new features with us. This will help us to make dbForge data Generator for Oracle yet better.